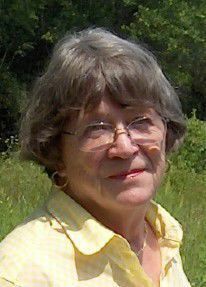 Billie Marie Moore died of cancer on October 16, 2018. She was originally diagnosed and successfully treated in 2010, but it recurred in spring 2017. She was born on September 7, 1938, to Ned and Pearl Hanna, in Potlatch, Idaho. She grew up on a small farm, thirteen miles north of there. For four years, with eight other children and one teacher, she attended the same one-room school that her parents had attended. After that school closed, the students were bussed to Potlatch for the remainder of their early education. In her junior year of high school, she married Forrest Franklin and joined him in San Antonio, Texas, where he was in training to become an Air Force pilot. The marriage lasted ten years, produced four children and caused her to become an avid reader, accomplished seamstress, oil painter, and a loving mother. She never returned to high school. With dependent children and no employable skills other than babysitting and housekeeping, Billie relied on a group of artist friends for encouragement and helping her decide about furthering her education. Rather than going back to high school, they recommended she go for testing at the Idaho Employment Service office. She was given a battery of tests and was urged to take an entrance exam at the University of Idaho. She passed the entrance exam in 1965, took on heavy class loads, worked nights as a nursing assistant, and graduated there in 1968 with a BS in secondary education majoring in life sciences, psychology and anthropology. During her final year at the University of Idaho, she met Michael Moore, who first charmed her by declaring that women were better company than men. He was also the man working at the local bank who called her repeatedly to inform her that her account was overdrawn. Her answer was “Of course it’s overdrawn. I’ll send you some money as soon as I get some.” She finally changed banks. However, Michael continued to charm her. Their romance blossomed and they married in 1967. Their marriage endured for over fifty very interesting and loving years. Michael was the first man she ever met whom she truly trusted. He was the kindest man as well. Soon after their marriage, Michael began to attend college at Idaho State University, and later at Oregon State University. In addition, he was learning the ins and outs of being a father to his ready-made children, Sue and Timothy. Sons Kenneth and Jeffery went to live with their father but remained in contact with Billie and Michael. Billie began teaching secondary school sciences, while painting in earnest and becoming accomplished in numerous artistic endeavors, including portraiture, clothing design and stained glass, taking some crafts to insane limits. She once macraméed a hammock. Many homes in the Corvallis/Albany area display her drawings, paintings, leaded glass lamps, windows, and fabric arts. She continued painting and displaying her artwork for her entire life while encouraging Michael to take up painting and assisting him in becoming a successful pastel artist. She displayed her work in numerous locations, estimating that she had painted well over 500 pieces in her lifetime as well as creating thousands of drawings and stained-glass items. Both she and Michael served on the Albany Arts Commission. Over the years, they arranged several shows for Albany artists at Albany City Hall, the public library, and at Giustina Gallery in the LaSells Stewart Center, on the OSU campus. Unfortunately, declining health slowed her ability to work on more display opportunities for Albany’s artists. She continued painting for her entire life. After teaching high school for a few years, Billie changed careers; returning to the hospital settings similar to those where she had worked while studying at the University of Idaho. She completed her nursing education at LBCC and worked as a Registered Nurse for many years in a wide variety of settings at Good Samaritan Regional Medical Center in Corvallis. She was instrumental in the planning and teaching of LBCC’s health careers classes at the high schools in Corvallis, Philomath, Lebanon, and Sweet Home. She often said that teaching the health careers classes was the best job she ever had. She especially enjoyed helping new nurses “learn the ropes” and was twice voted “Ideal Nurse” by graduating nurses at LBCC. She completed her nursing career as a Medical Case Manager for Regence Blue Cross in Salem, and as an independent case manager doing home health assessments for several clinics and other health insurance companies. She often said that she had never regretted for one minute her decision to become a nurse and often encouraged others to consider nursing as a career. In August of 1972, she and Michael, along with two friends, rented an airplane and parachuted into a concert by the Grateful Dead at the site of the Oregon Country Fair in Elmira. It was a benefit for the author Ken Kesey. When Billie hung up her helmet, she had logged 75 jumps and Michael 150. Billie is survived by her “loving special man,” Michael; very special daughter, Sue; son, Kenneth and wife Debi, son, Jeffery and wife Gerry, son, Timothy; brother, Jim; five grandchildren, David, Mathew, Sean, Jeremy and Katy; and four great-grandchildren. Left behind, are her three cats “children,” Abigail Van Purrin, Willow, and Denali. Please direct any memorial donations to Safe Haven Humane Society located in Tangent, Oregon. The family wants to thank Billie’s closest friends Barbara and Cheryl, in addition to all the hospice folks who visited Billie at home, and later the wonderful caregivers at the Albany Evergreen Hospice Facility, and at Anna’s foster house located in Albany.